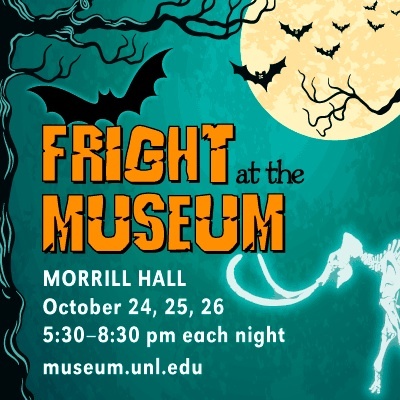 The University of Nebraska State Museum of Natural History's popular "Fright at the Museum" event will return Oct. 24-26 from 5:30-8:30 p.m. at Morrill Hall, south of 14th and Vine streets on the University of Nebraska-Lincoln City Campus. This three-night Morrill Hall-O-Ween fundraising event is intended for children and their families. Admission proceeds directly support the museum through new and enhanced exhibits, events and educational programming. Expect the unexpected in the perfect setting to be scared silly -- a natural history museum. Activities will be spooky, educational and just plain fun. There will be something for all ages on three floors of fright -- candy catapult, dino disco, creepy creatures, scary science, laser shows, performance by interactive music group The Mighty Magic Pants and more. The third floor will feature science experiments gone wrong (recommended for ages 8 and older with a parent or guardian). Visitors are encouraged to show off their costumes and bring their own bags to load up on candy and other goodies. Admission for Fright at the Museum is $6 for children ages 3 and up and adults; free for Friends of the Museum member and children age 2 and under. There will be no discounts for UNL students, staff and faculty for this annual fundraiser. Mueller Planetarium will present a special Halloween-themed laser show at 6, 7 and 8 p.m. Tickets will be $5 per person and sold in the planetarium lobby. Doors open at 5:30 p.m. Children must be accompanied by adults. Visitor parking is free in the loop south of 14th and Vine streets and Area A/C on W Street between 14th and 16th streets. For more information, visit http://www.museum.unl.edu/fright. Sponsors for Fright at the Museum include Sandhills Publishing, Pepsi, EyeCare Specialties and Whole Foods Market Lincoln. Additional support comes from ArtFX, The Mighty Magic Pants, and media partners KLKN-TV Channel 8, 104.1 The Blaze, KX96.9 and the Lincoln Journal Star. The University of Nebraska State Museum of Natural History in Morrill Hall is open 9:30 a.m. to 4:30 p.m. Monday-Wednesday and Friday-Saturday, 9:30 a.m.-8 p.m. Thursdays, and 1:30-4:30 p.m. Sundays. Parking is free in front of the museum. For further information, telephone the museum at 402-472-2642 or visit its website http://www.museum.unl.edu or Mueller Planetarium's website, http://www.spacelaser.com.